Disability Sport Wales definitely got thatstrapline right. There are very few things in this world that can unite peopleacross religions, abilities and borders but sport can. From the Olympic Gamesto local club competitions the ethos of sport remains the same: Try your best,respect your opponent and play by the rules. This ethos has allowed even thesmallest competitions to escape the shackles of prejudice and give all who wish a chance toparticipate. 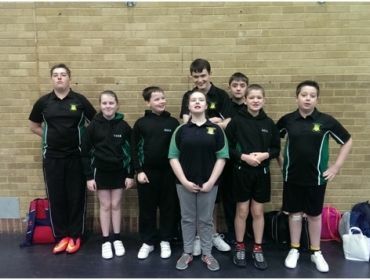 The 5×60 team in Rhondda Cynon Taf is committed to upholding theethos of sport and providing every young person with the same opportunities ina variety of sports. In the early hours on Wednesday 23rdof April alarm clocks across Rhondda Cynon Taf started to sound. 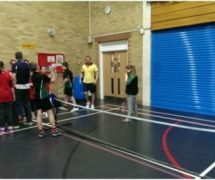 With thisawoke almost 100 young people who had been anticipating this very moment forweeks as this was the day they had beenwaiting for, this was the day it was all going to happen, this was the day ofthe SEN dodgeball competition! Finally the day had arrived, at last the hoursof fun spent with 5×60 officers during lunchtimes learning the rules andtactics could be translated into a county wide dodge ball spectacular. All schools are familiar with the morningbuzz created by friends reliving the antics of the previous night, or intenselydebating the latest episode of their favorite show, but none could compare tothe complete elation experienced by the 84 pupils from 9 different schools whosaw their 5×60 officers, waiting, dodge balls in hand, ready to take the shortbus journey to Llantrisant Leisure Centre. As the buses got closer to the venue thesmiles got bigger and bigger while the laughter became louder and louder. The organiserscreated the perfect environment for a competition of this nature and the youngpeople loved it. 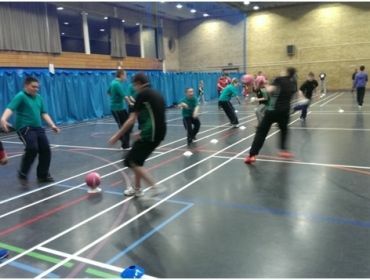 The immaculate hall at the Leisure Centre was split into acompetition area consisting of 2 full sized dodge ball courts while the secondarea labeled the play area was lavished with a table tennis table, badmintoncourt, soft tennis games and board games. The organisers asked all participants andstaff to gather for a short introduction but this was a bigger challenge thanthey expected. The young people were having such fun in the play area they hadalmost forgotten about the dodge ball. With a proud smile on their faces the5x60 officers rounded up the participants and eagerly listened while the organisersexplained the format of the day. With a quick cheer of excitement the talk wasover and the competition began. 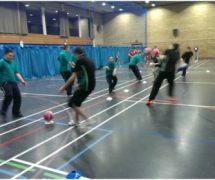 The group stages were a flurry of whizzingdodge balls, uncontrollable laughter and cheering team mates. All teams wereable to play at least 5 matches ensuring everyone had the opportunity toparticipate. The matches had a fascinating combination of intensity andcarefree fun, something that could be enjoyed and admired by all. The practice had paid off; all teams playedextremely well and threw the ball with precision. The work done by the 5x60officers at lunchtime was invariably evident throughout all teams as eachplayer understood the rules and tactics and found no difficulty in applyingthese during a real competition. As all things must come to an end so didthe group stages. 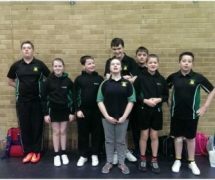 Treorchy Comprehensive School and Tonyrefail ComprehensiveSchool won their respective groups and progressed to the final. The stage wasset, court marked and dodge balls lined in the middle. With the crowd cheering,players itching to get started and University of South Wales studentsofficiating, the whistle blew to start the final match. Both teams chargedforward grasping the closest dodge ball and then hastily retreated back to thesafety of the baseline. A moment of utter stillness – who would throw first?Like the calm before the storm the crowd was silent… whoosh! The first ballflew. The calmness had ended and the storm that rained dodge balls hadbegun. With each hit, every caught ball,the crowd went wild. Treorchy went down to their last player while Tonyrefailhad more than half their team but this didn’t phase the young player. He dodged,ducked, dipped, dived and weaved around the onslaught of balls catching a fewto bring his teammates back into the game. With this heroic effort Treorchywere victorious. A cheer echoed around the hall and the players embraced infriendship and victory, the day was done. All participants received certificates aswhat they had done has truly inspired everyone lucky enough to witness. None ofthis would have been possible without the tireless efforts of the YouthEngagement and Participation team, 5×60 officers, Leisure Centre Staff and theUniversity of South Wales students. ‘The purpose of the event is to give youngpeople with additional learning needs the opportunity to compete in astructured competition across Schools in RCT. 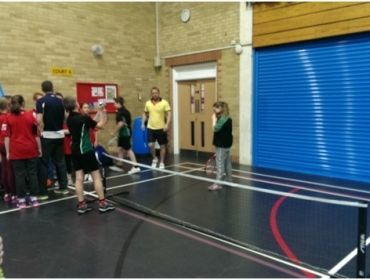 It allows them to meet newpeople, have fun and develop and improve their sporting skills.’ Leon Bansal – event organiser.